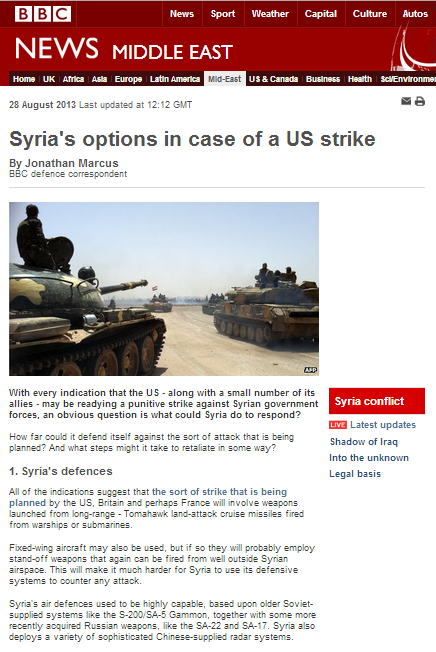 An article by the BBC’s defence correspondent Jonathan Marcus which appeared on the BBC News website on August 28th is titled “Syria’s options in case of a US strike“. An alternative approach would be to seek to broaden the conflict by striking at Turkey, US forces in Jordan or perhaps even to fire ballistic missiles against Israel. The risks here for the Syrian regime are huge. Turkey is well capable of defending itself, as are US forces in Jordan. In both countries there are Patriot anti-missile defences. An attack on Israel is also unlikely. The Syrian military is heavily committed in the civil war. Lashing out against Israel might provoke a massive retaliation – opening up the possibility of a wider regional war involving Syria’s ally, Hezbollah in Lebanon. Israel too deploys capable anti-missile systems. Provoking a wider conflict may not be in the interests of either Damascus, or importantly Tehran. Syria could seek to use a group like Hezbollah to carry out attacks against US or Western interests abroad. Here too though, the Iranian authorities may well have a view and with Iran seemingly intent on exploring a new opening with the West on its nuclear dossier, Tehran may be cautious about encouraging Hezbollah in this direction. “A senior Syrian army source told Iran’s Fars News Agency on Tuesday that a full-scale US attack on Syria would justify an attack on the Jewish state. “If Damascus comes under attack, Tel Aviv will be targeted too and a full-scale war against Syria will actually issue a license for attacking Israel,” the Syrian army source said. Whilst bellicose rhetoric of the type currently being bandied about by Iran and Syria is hardly a rare event in the Middle East, what it represents it is certainly a part of the ongoing story of which BBC audiences should be made aware if they are to be able to fully understand current events in the Middle East. Significantly, that aspect of it is being conspicuously toned down for BBC audiences. 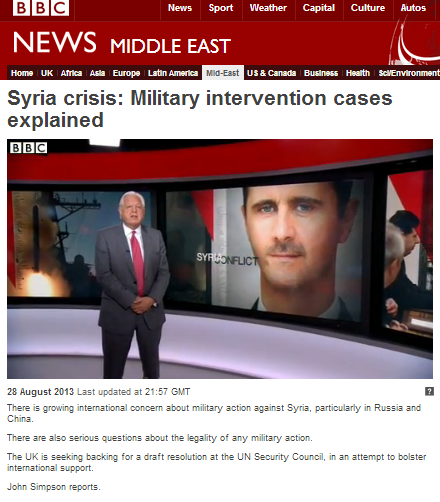 A filmed report from August 28th titled “Syria crisis: Military intervention cases explained” which appeared on BBC television news, as well as among the extensive Syria coverage on the BBC News website’s Middle East page, purports – according to its title – to clarify the opposing arguments for audiences. The BBC has even brought in the big guns in the form of its veteran World Affairs Editor John Simpson to do the job. But if audiences were anticipating an impartial, accurate and informative presentation of the cases for and against Western military intervention in Syria, they would have been sorely disappointed by Simpson’s ill-disguised attempts to make parallels with the Iraq war, presented in facetious tones and with barely concealed disdain. Simpson’s attempt to persuade BBC audiences that the Syrian regime’s chemical weapons stockpiles are to be the target of missile strikes is obviously inaccurate and misleading. No such intention has been declared – quite the contrary in fact. “With an estimated 50 storage sites, many situated in or near urban centers, any attempt to destroy or degrade the Assad government’s supply of poison gases and nerve agents would require a massive invasion of ground forces that no nation considered part of the emerging “coalition of the willing” would be likely to support. Even if U.S. and allied intelligence have precisely located some of the stores of sarin, mustard or VX gas, analysts say, the likelihood of a successful airstrike is slim because of Assad’s powerful air defenses and the risk of bombed chemical stores unleashing their deadly gases. “The Pentagon will probably avoid targeting stockpiles, which could send toxic gases into the air and cause civilian casualties. Regardless of one’s view of the merits – or lack of them – of a limited scope strike on the Syrian regime’s facilities, BBC audiences’ understanding of the issue is obviously not enhanced by invented factors. John Simpson’s misleading promotion of the notion that Western forces intend to target “President Assad’s chemical weapons” clearly lacks supporting evidence and breaches BBC editorial guidelines on accuracy. The reasons behind the employment of that inaccurate claim should also raise questions about this report’s impartiality. Despite there being to date no acknowledgement of the fact in the form of a footnote, an article dated August 13th which appears on the BBC News website has been amended. Mr Solomon did not find this acceptable and wrote back to the BBC to demand that the language used accurately reflect the known facts. The BBC News website’s Middle East desk accepted Mr Solomon’s point, with the result that the wording was eventually amended again to read as above. Having therefore acknowledged that its original wording in that article was not sufficiently accurate, it would of course be appropriate for the BBC to likewise amend other items appearing on its website in which the same wording appears – such as this one. As long-time readers of BBC Watch know, we have frequently highlighted the fact that BBC Editorial Guidelines apply to all BBC content – including social media. Twitter – being fast-moving ‘instant’ messaging and cutting out the editorial ‘middle-man’ between the journalist and the public – is of course particularly susceptible to breaches of those guidelines. Last November Mr Stephen Franklin submitted a complaint to the BBC regarding two Tweets sent during ‘Operation Pillar of Cloud’. One of those Tweets originated from the BBC World News account and the outcome of the complaint was documented here. The other Tweet originated from the account of the then BBC Jerusalem Bureau correspondent Wyre Davies and the BBC’s Editorial Standards Committee published its findings with regard to Mr Franklin’s complaint of inaccuracy on August 29th 2013 – on page 21 here. In this “limited operation” at least 13 Palestinians and 3 Israelis have been killed – nearly all civilians. #Gaza. Here is a screenshot of the Tweet with its local time time-stamp rather than the GMT time-frame cited by the committee. Whilst accepting that the Tweet breached BBC Editorial Guidelines on accuracy (the Palestinians killed at that point were not “nearly all civilians” as we pointed out at the time), the committee makes much in its findings of the circumstances in which it was written. However, at the time that Tweet was sent – some 18 hours or so after the beginning of the operation – Wyre Davies was not in Gaza, but in Israel – as one of his earlier Tweets shows and as documented at the time by BBC Watch. According to his own Twitter timeline, Davies entered the Gaza Strip nearly an hour and a half after sending the Tweet concerned. This is not the first time that the BBC’s reliance upon information obtained from “health officials in Gaza” has proved to be an issue and unfortunately, the BBC Trust does not appear to be sufficiently aware of the problematic aspects of that practice. Of course Wyre Davies’ claim that “by common consent more civilians than combatants were killed on both sides” is also inaccurate and it is regrettable that the ESC chooses to repeat such an inaccuracy in an official document. Neither he nor the Editorial Standards Committee appears to have taken note of the fact that two of the Palestinian casualties included in the numbers Davies cited in his Tweet – one of them the son of a BBC employee – were later shown to have been killed by a short-falling terrorist rocket. In its uncalled-for ruling on the impartiality of that Tweet, the ESC has obviously not taken into consideration the fact that by the time it was sent, Davies’ colleagues had begun an extensive campaign of emotion-fuelled promotion of those deaths as having been caused by Israel – despite having no factual evidence for that claim – thus creating a climate of ‘group think’ which may well have influenced the composition of the Tweet, and with neither Davies nor any other members of the BBC team in Gaza at the time having shown any evidence of questioning that false narrative. Wyre Davies has since moved on to pastures new, leaving those whom he condescendingly belittles as “armchair critics at home” to continue living in the “fog of war” which is for some of us a permanent state of affairs rather than a mere temporary assignment. He and his other colleagues who have likewise since relocated elsewhere also leave us to deal with the fall-out of unprofessional, inaccurate and partial reporting by correspondents who do not appear to appreciate the consequences of shoddy journalism. Unfortunately, the BBC Trust’s Editorial Standards Committee’s appreciation of those consequences appears to be little better. The International Atomic Energy Agency says it was. US intelligence says it was. The BBC, however, is apparently not convinced. 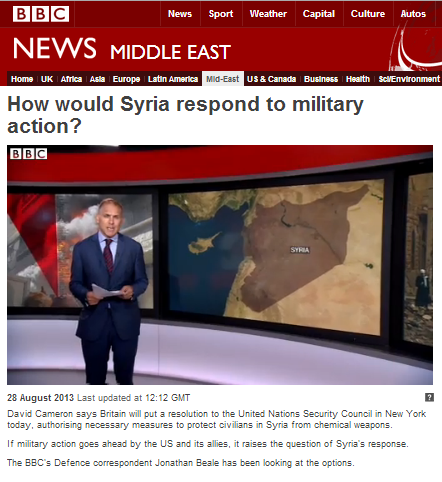 If you happened to be watching BBC television news coverage on the subject of a potential Western attack in Syria on August 28th you could hardly have failed to miss the repeated broadcast of an item by BBC defence correspondent Jonathan Beale which also appears on the Middle East page of the BBC News website under the title “How would Syria respond to military action?“. More than two years ago the IAEA stated that the Al Kibar facility near Deir ez Zor was a nuclear reactor in the final stages of construction. “The UN nuclear agency on Thursday said for the first time that a target destroyed by Israeli warplanes in the Syrian desert five years ago was a covertly built nuclear reactor, countering assertions by Syria that it had no atomic secrets to hide. More than five years ago American national security officials briefed Congress on the issue. The US administration at the time knew exactly what Al Kibar was even before the strike took place. By unnecessarily inserting the word ‘suspected’ when describing what the top authority on the subject says unequivocally was a nuclear facility Jonathan Beale is clearly both misleading BBC audiences and in breach of BBC editorial guidelines on accuracy. Among the reams of coverage of the subject of possible Western military action in Syria appearing on the BBC News website’s Middle East page we find an article titled “Syria crisis: Where key countries stand” dating from August 27th. Countries of course do not “think”; in fact the article purports to condense the stances of various governments in the Middle East and elsewhere on the subject of potential Western action into a few bite-sized sentences. Here is what it says about Israel. 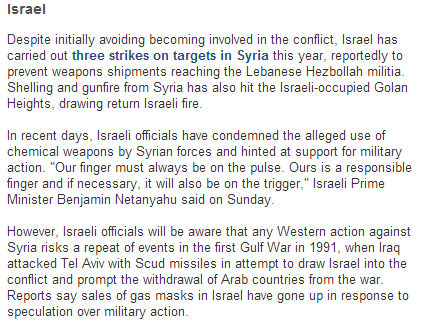 In spite of the BBC’s suggestion to the contrary, Israel is not “involved in the conflict” in Syria. That conflict is a civil war between Assad loyalists (and their foreign allies) and anti-Assad rebels (and theirs) and Israel does not support one side or the other. Any actions which may have been taken by Israel are exclusively linked to the protection of its citizens. The link appearing in this paragraph leads to a Q&A article published by the BBC on May 5th of this year which also tried to imply Israeli ‘involvement’ in the Syrian conflict. The use of the phrase “reportedly to prevent weapons shipments..” is clearly meant to signal to BBC audiences that the writer of this report is not convinced that is the case – a theme which has also been promoted by the BBC on previous occasions, not least by its Middle East Editor. In the interests of the BBC’s supposed commitment to accuracy, the final sentence of that paragraph should of course have made clear the fact that Syrian shelling and gunfire into the Golan Heights has sometimes drawn return Israeli fire – but in the majority of cases it has not. The juxtaposition of those two particular sentences is clearly intended to suggest to BBC audiences that any Western military action in Syria is likely to include Israel. However, the partial quote from PM Netanyahu used to suggest that is taken out of context. Netanyahu’s words were said during a meeting of the Israeli cabinet on August 25th and in fact related to the subject of Israeli self-defence in the event of attacks on Israel by the Assad regime or any of its allies rather than in the context of Israel’s joining a Western coalition to take action in Syria. The statement that “Iraq attacked Tel Aviv with Scud missiles” is of course inaccurate. As was reported by the BBC itself at the time, Scud missiles were also fired by Iraqi forces at Haifa and other locations in Israel, including the Dimona region in the Negev. The statement “sales of gas masks in Israel have gone up..” is also inaccurate. Gas Masks are not sold to the Israeli public, but distributed by the Home Front Command, in part via the Postal Services. Interestingly, in the section titled “Lebanon”, this BBC article does not make any reference to Lebanon being “involved” in the conflict in Syria, despite the fact that Hizballah – which holds seats in the Lebanese parliament and government – is actively fighting there. As readers may have already noticed, Paul Danahar moved on from his position as head of the BBC’s Middle East Bureau in Jerusalem last month and is now in Washington. 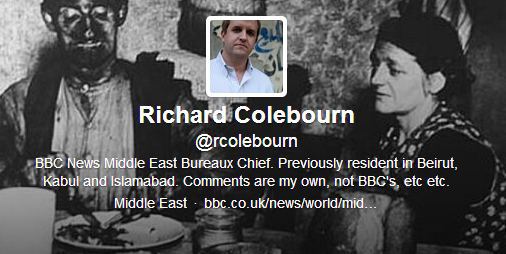 His replacement is Richard Colebourn who was formerly based in Beirut. 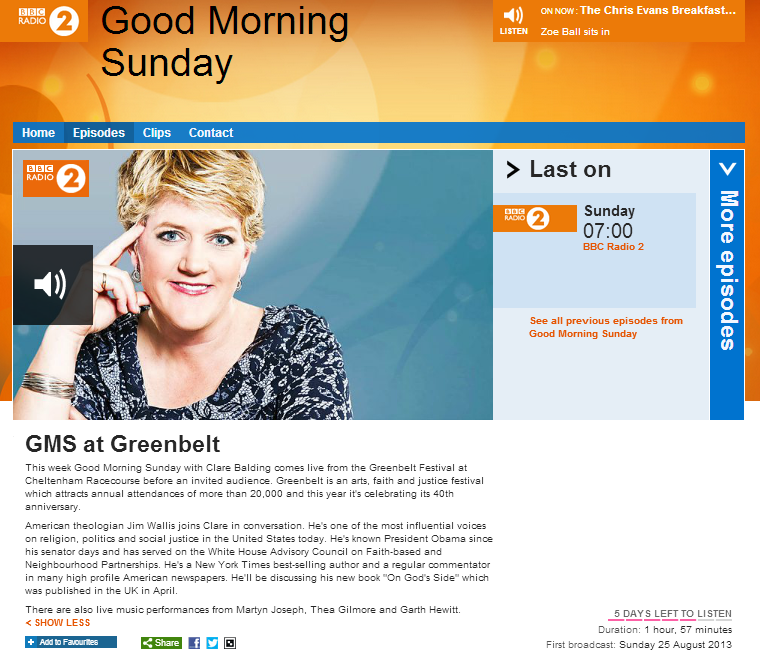 The Sunday August 25th edition of the BBC Radio 2 programme ‘Good Morning Sunday’ hosted by Clare Balding featured a two-hour live broadcast from Cheltenham Racecourse where the Greenbelt Festival was being held over the bank holiday weekend. The programme can be heard here for a limited period of time. In the above synopsis the event is described as “an arts, faith and justice festival” – with that portrayal having come straight from the festival’s own tin – but as many readers probably know, there is a lot more to the Greenbelt Festival than just happy clappy music gigs and some of the event’s other strata raise the very serious question of why the BBC spent two hours putting lipstick on this event. Near the beginning of the programme Clare Balding remarks on the “lovely feel” to the festival and her interviewee, the festival’s creative director Paul Northup, describes the event as “inclusive” and engaging”. However, any stray Israelis who happened to stumble upon it would probably find the event decidedly less than inclusive. Balding makes no mention of the fact that one of the festival’s ‘attractions’ was a “giant interactive floor game for all ages” titled “Occupation”. “Our installation in the Centaur foyer aims to give a glimpse of the challenges faced by ordinary Palestinians living under Israeli occupation. There’ll be a giant, interactive floor game – Occupation! – for all ages. Roll the dice and make your way through checkpoints and challenges, permit denials and poverty. On your journey, you’ll learn about the issues affecting the West Bank and Gaza and find out how you can help Embrace the Middle East to make a positive difference to the lives of marginalised people. 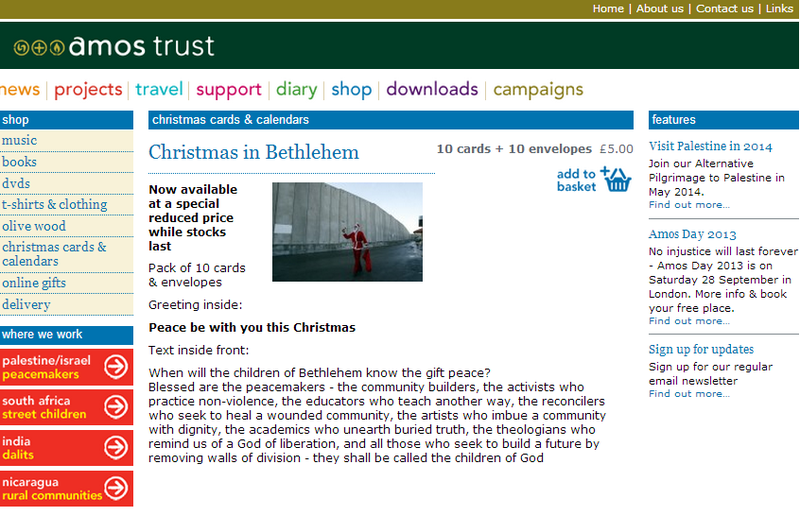 The organizer of that exercise in the indoctrination of the hundreds of children who attended the festival is ‘Embrace the Middle East‘ – a Greenbelt associate partner – which might be better known to some readers under its former name of ‘Bible Lands’ and which continues to be headed by anti-Israel campaigner Jeremy Moodey. 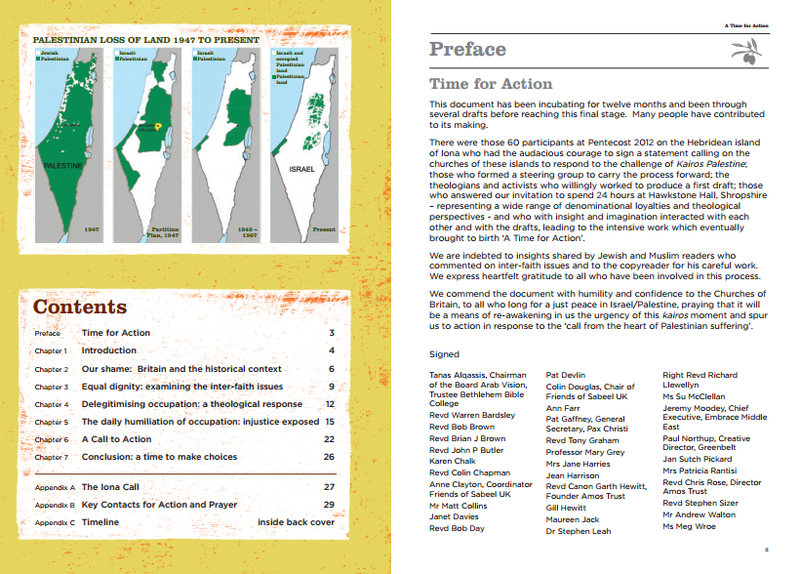 An additional Greenbelt event organized by ‘Embrace the Middle East’ was the official launch of a document titled ‘Kairos Britain: A Time for Action’, which purports to be a ‘response’ to the 2009 ‘Kairos Palestine’ document. The ‘Kairos Britain’ document is replete with far too many distortions and downright lies to mention in this brief article, as readers can see for themselves here. Those familiar with the Christian anti-Israel scene in the UK will recognize many of the names endorsing it (see the ‘related articles’ section below) and this screenshot of the document’s first page – illustrated with the infamous ‘maps’ which would be avoided like the plague by anyone with an honest agenda – gives some idea of how this document makes a mockery of the commandment “thou shalt not bear false witness against thy neighbour” to which its authors presumably supposedly adhere. Clare Balding refrains from asking Paul Northup about his signature’s appearance on that decidedly non-inclusive ‘Boycott Divestment and Sanctions’ promoting document. She also ‘forgets’ to tell audiences that her musical guest Garth Hewitt is another signatory or that he is a patron of the Hamas-supporting Palestine Solidarity Campaign and heads the anti-Israel campaigning ‘charity’ ‘Amos Trust’ which even exploits Christmas to spread anti-Israel propaganda. Balding’s main guest is Jim Wallis, but again she neglects to mention his anti-Israel agenda and his organisation’s magazine’s repeatedly problematic portrayal of Christianity in the Middle East. 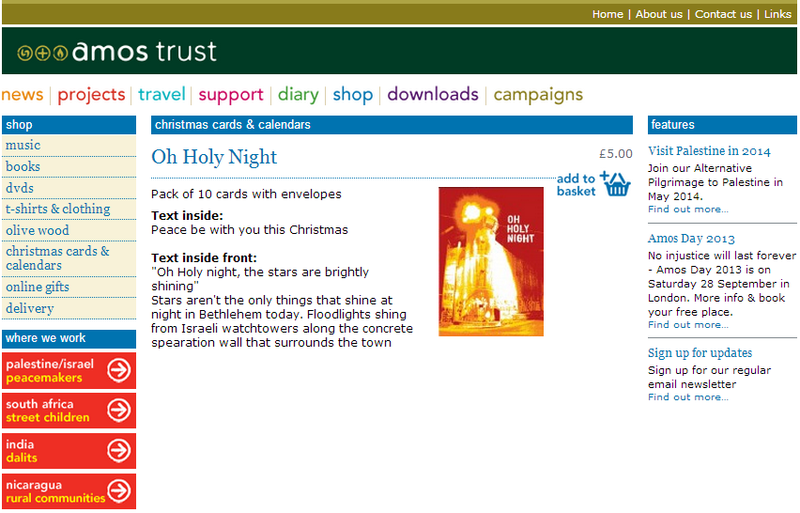 Of course the vast majority of Christians in the UK have no time for the type of anti-Israel agenda promoted by the organisers of the Greenbelt Festival, but nevertheless BBC Radio 2 not only saw fit to devote an entire programme to this fringe event, but also completely whitewashed its anti-Israel campaigning with astounding efficiency, with the result that listeners would get the impression that this is no more than a cuddly extended church coffee morning with live music. Beyond the obvious issues of accuracy and impartiality, it will clearly be of concern to many a licence fee payer to discover that the BBC is complicit in promoting and sanitising an event which stigmatises an entire nation, hence mainstreaming that delegitimisation.